What is perhaps most interesting about Ruth Proctor and João Ferro Martins‘ show at The Mews Project Space is the way their work is so similar yet has subtle differences when neither had met until they hung the exhibition. Following a set of outline instructions for sculpture combining found or ready-made materials, striking similarities occur in the choice of orientation of objects whilst differences appear in the choice of object design; straight edges versus curves, material, dimensions, volume, weight, colour, etc., which combine to give Martins work an austere, solid and workerly feel, whereas Proctor’s has a sunnier, more vibrant and perhaps feminine outlook. With a bass ‘E’ guitar string stretched across each chair as if to create a rudimentary instrument, a vinyl record is similarly placed behind the back of the chair so about 60% visible from the front, but one is an album and other incorporates a single. 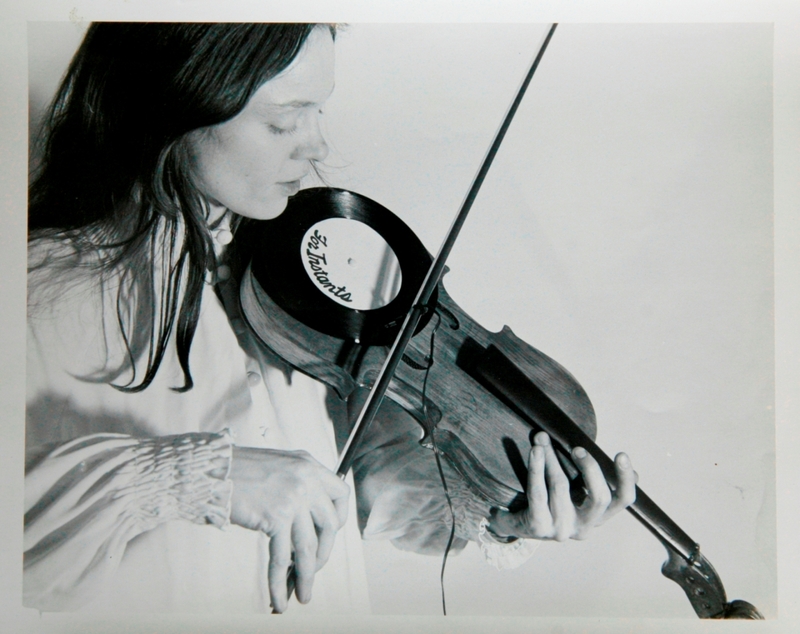 Meanwhile, at the Barbican, Laurie Anderson is pictured playing her musical invention/sculpture, the Viophonograph, with a record mounted upon a violin body and a pickup in the bow. Perhaps it might also be relevant to mention Christian Marclay’s Recycled Records (1980-86), at this point, as another example of an artist using this sonic yet visual form, combining cut records to create a new sound. Meanwhile Martins’ further experiments with record media include Cymbal Scratching (2010), which seems to be the inverse of Anderson’s work in that a traditional instrument is being played by a twentieth century one, whereas Anderson plays the record with the violin bow. Cymbal Scratching (2010) by João Ferro Martins. Turntable, amplifier, pre amplifier, two speakers, cymbal. Dimensions variable. Sound reproduction of the texture of the cymbal. Mary Temple. South Light for a Sunny Day, Chateau de Chamarande, France. (2008), (from the series Light Installations 2002-ongoing). Latex paint on existing architecture. Proctor and Martins are also showing a series of Polaroid photographs of what might be described as backgrounds that have been over-painted solid blocks of colour in triangular and circular forms in a similar manner to Example’s music video. Many of the Polaroids depict dappled shadows cast upon the ground by trees, much like the subverted installation paintings of Mary Temple. Like Gordon Matta-Clark, included in the exhibition with Anderson, Temple has directly affected built environments. Matta-Clark made permanent incisions into the fabric of buildings, somewhat similar to Marclay’s action with the records but on a much larger scale and in a more deconstructive manner, introducing natural elements into the built environment and exploring its structure. 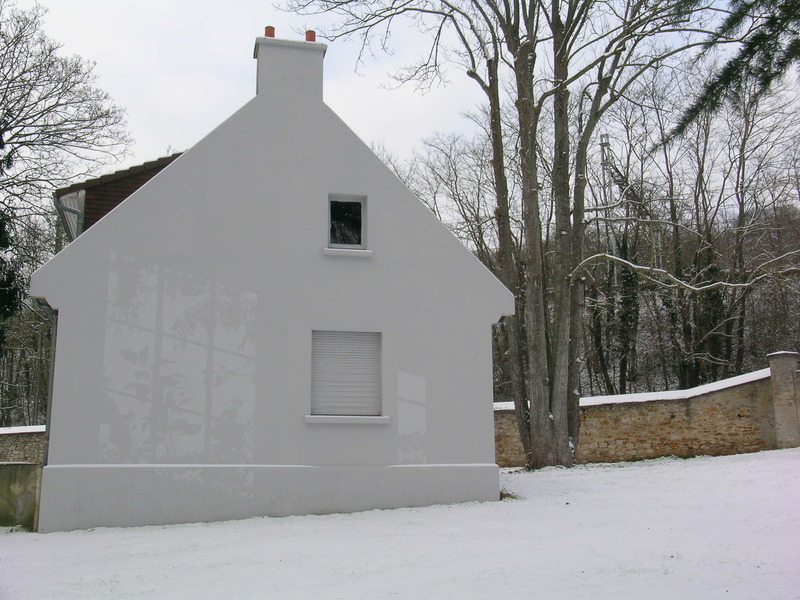 Meanwhile, Temple creates much more restrained works, painting permanent shadows upon building surfaces which could potentially last for the lifetime of the building. 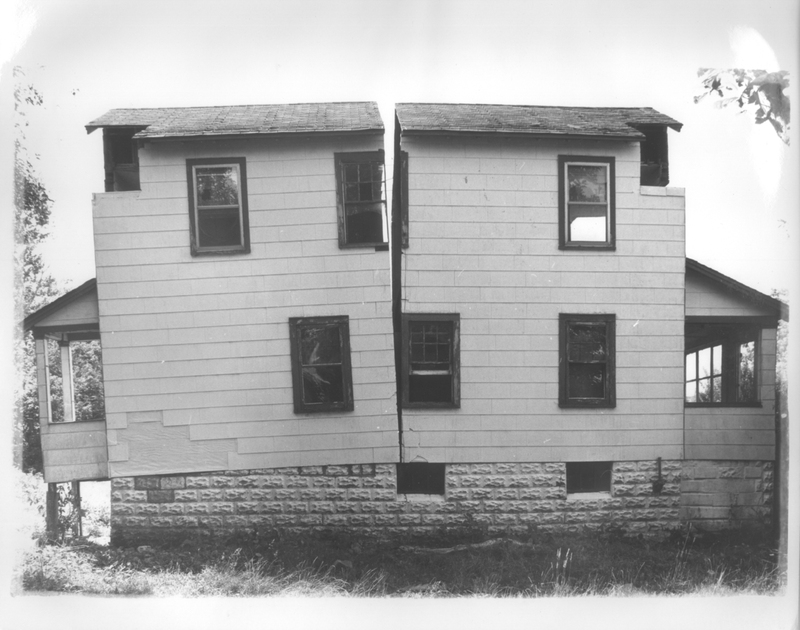 Gordon Matta-Clark Splitting 9, 1977 Gelatin silver print Courtesy Museu d’Art Contemporani de Barcelona Collection. Fundacio Museu d’art Contemporani de Barcelona. Long-term loan of Harold Berg© 2011 Estate of Gordon Matta-Clark / Artists Rights Society (ARS), New York, DACS London. Ruth Proctor and João Ferro Martins are on show at The Mews Project Space, 15c Osborne Street (in alley to the west), E1, Sundays 4-7pm and by appointment until 15th May 2011. Ruth Proctor is also exhibiting I’ll Be Your Mirror at Siobhan Davies Studios, 85 St George’s Road, SE1 6ER from 13 May – 25 June 2011. Laurie Anderson, Trisha Brown, Gordon Matta-Clark Pioneers of the Downtown Scene, New York 1970s closes on 22nd May at the Barbican Centre, Silk Street, EC2Y 8DS. Mary Temple has works on show in various exhibitions around USA, see website for details.